Dino again opted out of today's Mexican-food lunch offerings - taco with cheese and chips and rice, or fiestada pizza. I packed him the rest of his French bread pizza and apple slices from Monday's dinner at Mellow Mushroom, carrots and broccoli (more carrots underneath), ranch dip (more about that in a minute), and an all-beef hot dog (some of which was paired with bits of carrot to make "hot dog flowers"). I got this box at the local Dollar Tree store. Actually, I got 3 of them - green (shown here), blue, and red. The box has a built-in compartment perfect for something liquidy, like dip or applesauce, with its own little tight-sealing lid. I also used silicone muffin cups (one round and one square) to separate the fruit and veggies from the proteins. I didn't think he'd care if the hot dog and pizza touched. Dino ate every bite and said it was good. All the pieces returned home this time after telling him the only thing that gets thrown away is the paper napkin! Ok, let's talk about this ranch dip. This ranch dip has to be the best ranch dip I have ever tasted: Marzetti Light Ranch Veggie Dip. It is found refrigerated in the produce section of the supermarket, does not taste "light" at all, and actually has bits of veggies chopped up in it. It is thick, creamy, and perfectly tangy. I've always been a Hidden-Valley-mix-with-sour-cream kind of girl, but I'll be looking out for this stuff from now on! 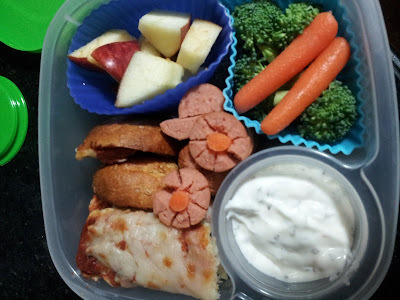 Ranch dip gets my boys to eat sooo many more fresh veggies. Dino suddenly decided he liked broccoli with ranch a couple of weeks ago, and this week he even liked fresh zucchini! Win! Disclosure: Though this post contains product links, I have not been compensated in any way for writing this post or pulling this information together. I just really like that dip!